MIKE SANTOLI: All right. It is time for that big interview of the morning. Steve Liesman is at the American Economic Association’s Annual Meetings in Atlanta. He joins us now with a special guest. Good morning, Steve. STEVE LIESMAN: Yeah. Thanks, Mike. Lots to talk about so let me get right to Loretta Mester, Cleveland Fed President. Thanks for joining us. STEVE LIESMAN: So some people on our air, some market commentators say the expressed intent of Federal Reserve policy right now is to make people unemployed, to throw people out of work, and to raise the unemployment rate. Isn’t that what you guys want by tightening in policy right here? LORETTA MESTER: Absolutely not. We are – maximum employment is one of our dual mandated goals. We are certainly going to try to run our monetary policy to achieve and maintain those goals. We want people working. We want a healthy economy. And we’re trying to guide our policy in order to achieve those goals. STEVE LIESMAN: But by tightening policy and raising rates, isn’t one of the outcomes of that normally higher unemployment? LORETTA MESTER: Well we’re trying to gear the economy. We don’t want it to overheat, which ends up with bad outcomes for the public. We know when we went into a recession, that wasn’t a good outcome for anyone, including a lot of people who were thrown out of work. And yet we don’t also want to put on the brakes on the economy. Right? We want to sort of basically calibrate our policy so that we can maintain the expansion, keep people working, keep the economy healthy. STEVE LIESMAN: That’s not what markets appear to think you’re doing. Which is, markets are taking a very negative message from the Federal Reserve. What do you hear? What signals do you hear from the downdraft in stocks from very low interest rates right now. Is it telling you that maybe you have the outlook wrong here? And is it telling you that maybe you should slow down or pause? LORETTA MESTER: So I think there’s a lot of currents affecting the markets. I don’t think it’s all about their assessment of Fed policy. I think there are downside risks to the economy. We’ve seen some slowdown in Europe and in China. We saw the ISM index still showing growth in manufacturing but at a slower pace. And I think that’s what’s going on. I think we weren’t expecting 3% growth next year. We all have rationed down our forecasts. I think the markets are putting a lot of emphasis on the downside risks. There are also some upside risks. And now we’re trying to calibrate our policy to that outlook. But again, we’re going to take the signals that we’re getting from the market. They could be — their assessment of the risk could be different from ours, and we’re going to look at those, as well as the information we get from our business contacts about what actual businesses are doing in terms of their hiring and their investment and use that to inform our outlook and to guide policy. But I think we’re in a good spot with policy actually. STEVE LIESMAN: You don’t think the policy is too tight here? LORETTA MESTER: I do not. I think basically we are at a good spot. We can take time. We don’t have inflation you know, running ahead. We don’t see it accelerating. We see it around 2%, which is good. We see strong labor markets, which is good. And we have time to assess the situation. So I think we’re actually in a good spot. STEVE LIESMAN: Do you forecast the Fed will tighten more next year? LORETTA MESTER: So as you know, our meeting forecast across all the participants of the FOMC has a few more rate increases for next year. But this is all dependent on how the economy performs. Right? We’re going to look at the data, we’re going to look at our business contact information from both the labor market side, the consumer side, and business side. And we’re going to use that to inform our outlook for the economy. But again, we’re starting at a really good spot. The economy was very strong last year. These are good things. Now we’re going to a bit slower growth as we anticipated and now we’re just sort of calibrating to that. STEVE LIESMAN: If I’m a market participant here and I see the economy performing the way the consensus of the Fed believes it will perform, 2.3% GDP, unemployment rate ticks down to 3.5%, inflation remains stable at 2%. In that context, should I expect two rate hikes from the Federal Reserve? LORETTA MESTER: Well, I think that’s what our best estimate is in terms of the median. But again, right, one or two rate hikes, right, is about where we’re seeing the economy now. It will really depend on how the economy performs. But frankly, I think that’s a really good forecast, right? If we got an economy that performed that well, basically soft landing into you know, a slowdown towards trend growth, we should be very happy with that. STEVE LIESMAN: I have one more question and then I want to get to questions to the anchors. But real quick, you voted for an increase in December, right? STEVE LIESMAN: Okay. Before you went into that meeting, global economies were already weak. The market had turned down, interest rates were lower and trade problems were already out there. In the face of those four problems, you didn’t see an issue or a reason to pause? LORETTA MESTER: No. Because I think on the other side was — the actual hard data that we got from our business people were that, yes, there were concerns about trade policy and there continue to be there’s uncertainty around that. But it hasn’t really impacted the business plans. They were trying to hire. They were having trouble finding qualified workers. In fact, that was actually hurting their ability to fill orders. They were not changing their investment plans. We had some firms that said they were thinking about maybe changing their investment plans. But overall, right, it was a cautious, you know, optimism that things were going to go through. But again, that’s the actual monetary policy-making process. We had to take into account all the data from the markets and from the businesses and from the consumer side, and use that to assess our – you know, where we want policy to be. STEVE LIESMAN: My colleagues in Englewood Cliffs have a few question. Guys? JOE KERNEN: Actually, you kind of asked what I was going to ask. You followed up at the same time I raised my hand, Steve. But just to ask it again, President Mester, if we have good economy as you said, the economy continues to perform well, but we don’t see any inflation pickup into next year, why does it make sense at this point to predict two rate increases? LORETTA MESTER: Well, we’re always looking forward, right? So when we put down our forecast, we have to predict where is the economy going and what’s the appropriate policy to achieve those outcomes? So you don’t set policy and then say, “Okay, what’s the economy doing?” It’s all sort of part of the mix. You’re right. If we don’t have inflation moving — you’re exactly right. If we didn’t foresee that inflation was moving up, then we could be stopping here. JOE KERNEN: Okay, because it didn’t sound like that. LORETTA MESTER: You know – we could – it’s really going to be where is the economy going? Where is it going, and what’s the appropriate policy to get there? LORETTA MESTER: We all wrote down our forecasts and in those forecasts, right, we all had to put down an appropriate policy path. But I’m open to sort of saying the economy tell us, right, maybe we pause for a while, we assess things, and we look at where the economy is going. But we always have to be forward looking. We can’t look backward. LORETTA MESTER: Well hold on. I don’t think that that’s true. I don’t think we have no reason to think it’s coming. I do think that, you know, we’re in a good spot. We don’t see inflation accelerating aggressively. We don’t see, you know — we see a strong labor market. So I agree. And we see growth decelerating towards our trend. So I agree with you. We’re in a good spot. I don’t think we’re ahead of the curve. I don’t think we’re behind the curve. I think we’re in a good spot. And now it’s just really assessing the incoming information that we get on where the economy is, what the risks look like going forward. So I do agree with you, we’re in a good spot. STEVE LIESMAN: President Mester, do you think that policy is currently stimulative? Are you below neutral, and do you think the Fed needs to get to a neutral rate? STEVE LIESMAN: Already in the range of neutral? LORETTA MESTER: — whether we’re at neutral or not. And that’s precisely to me what data dependency means. We’re now going to have the economy assess incoming information. It’s going to tell us. If we don’t see inflation picking up and we see the labor market staying reasonably you know, strong from where we are now, then that may tell us we’re at neutral. But if we see inflation picking up, then we’re perhaps a little stimulative on the monetary policy side. The economy is going to be telling us where we are. STEVE LIESMAN: I want to follow up on that, because I think that’s an important comment I think, which is that are you saying that if inflation remains around 2% and unemployment bounces around this 3.7% rate that you won’t see a need for further rate hikes? That will tell you we’re at neutral? 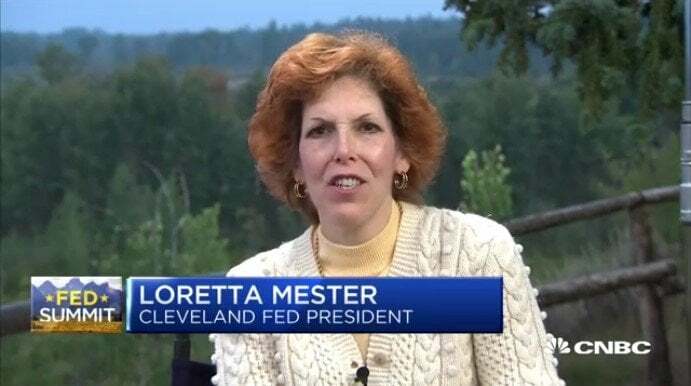 LORETTA MESTER: I think we’re going to be reassessing – I certainly would reassess my forecast of where I think the normal rate of unemployment or the long run rate of unemployment will be. And I think what you’ve seen over time is we have been reassessing where we think those longer run stars as the chairman says –calls them, are. And so I’ve certainly lowered my long run employment rate. The longer we go on without sort of these without these imbalances building up, the more I’m going to be reassessing things. STEVE LIESMAN: What about balance sheet? Are you reassessing the balance sheet? There’s a lot of concern that the balance sheet is a – I mean, it’s not stealth anymore but it wasn’t stealth tightening and then all of a sudden, a lot of people are talking about the balance sheet plan to roll off $600 billion of securities. Is that something you should be rethinking? LORETTA MESTER: So I’ve been very supportive of what we’re doing with the balance sheet. I don’t think at this point I’m going to reconsider the balance sheet. But I don’t agree with the interpretation out there that we have forgotten about the balance sheet. We have that going on. The balance sheet is being reduced in a very gradual and predictable manner. And that’s part of the economic environment that we take into account when we’re setting our interest rates. STEVE LIESMAN: But the chairman says it’s on autopilot. And it’s also been said you would not adjust the balance sheet roll-off pretty much until you’ve brought rates down to zero. LORETTA MESTER: Right. Well, I think if you actually look at the documents that we put out describing the balance sheet and how we were normalizing the balance sheet, we always left open the fact that if the economy deteriorates and we need to change our balance sheet policy, we are going to be changing the balance sheet policy. So it’s on autopilot in the extent of we’ve set a plan, we’ve set out what it was, we wanted the markets to understand what the plan was. But if the economy deteriorates in a way that necessitates changing that plan, we are willing to do it. I don’t foresee that happening in the economy at this point but we’ve been open to that and we’ve said publicly that that’s what we plan to do. STEVE LIESMAN: Becky has a question back from Englewood Cliffs – or from Nasdaq, sorry, in New York. BECKY QUICK: President Mester, you said that you’re listening to signals from the market and that goes into your economic outlook, all of the output – all of the input that you’re putting into these things, but you also say you’re listening to business contacts. What are you hearing from your business contacts about the economy? LORETTA MESTER: Right. So our business contacts have been more optimistic than you would get than just looking at the markets. They are certain concerned about policy trade, many of them. The uncertainty around that is something that concerns them. But up until, you know, very recently, they hadn’t really changed their plans. Hiring is an issue. They have difficulty hiring qualified workers. They’ve been trying to be creative in how they go about sourcing workers. But again, it’s still a difficulty for them. And that seems to be the main difficulty. I think no one likes being in an uncertain environment and that is affecting their outlook. But again, they haven’t really taken hard actions. Only a few firms have said they really put plans on hold due to the uncertainty. STEVE LIESMAN: But yesterday we heard from Apple. Actually, that might have been the day before. That told us that iPhone sales are down in China and that’s in part due to trade tensions. Are you seeing this? There was an editorial in “The Wall Street Journal” they called ‘the iPhone as a canary’ or something along those lines. Is it a canary? Is that a sign to you that things are slowing down globally maybe faster than you had thought? LORETTA MESTER: Well we certainly know that in China we have had reports that the growth there is slowing. And that certainly has informed the outlook. If you look at the FOMC statement from the last meeting, right, we pointed out we are monitoring global developments and financial market developments. So this is something that we know, right, is part of the economic environment. And certainly something I’m going to be paying attention to when I’m evaluating the economy going forward talking to business contacts in my district and elsewhere. STEVE LIESMAN: Do you have a heightened fear of recession next year or the year after? BECKY QUICK: President Mester, I’m watching on Twitter kind of reaction to what you’re saying and it’s funny because as often happens with Twitter, there are some people who think you sound incredibly dovish, others who think you’re looking at two more rate hikes for this year and I can hear the parts in the interview where you’ve said things to make all these people think all of that. I want to come back at you and just give you a chance. Maybe you’re trying to not let anybody pin you into a corner. But if you were to sit right now and look at things, I heard you say that you think we’re in the low end of the neutral rate right now, so maybe that signals we won’t see more rate hikes. I also heard you say that, yeah, if the economy keeps going along, we could see two more rate hikes. If you had to vote today based on the information you’re hearing, would you say raise rates right now again? LORETTA MESTER: So I think we’re in a good spot. As I said earlier to actually assess the economy so I don’t have to vote today. And I want to take the time that I have to actually evaluate how the economy is going. I don’t feel an urgency to increase rates from where we are now because I see an impending inflation problem. I don’t see that in the data. I do think that, you know, we have to take into account that financial market conditions have tightened. And we want to build that into our forecasts. So again, I don’t have to vote now and, you know, I’m not going to give you where I’m going to be voting in the future. I want to take the time I have to evaluate where economic conditions are. But again, I do think policy is neither you know, ahead of the curve or behind the curve. I think we’re in a good spot. STEVE LIESMAN: I’m going to ask you the last question but I want to make sure — Joe, I was expecting you to ask Miss Mester if she had the jobs number and if she’d share it with us early. But you didn’t do that, Joe. JOE KERNEN: I would like that. Well, we’ve only got 11 minutes. STEVE LIESMAN: Yeah. Go ahead, Joe. JOE KERNEN: Can you give us a number early? STEVE LIESMAN: A wink or a nod or anything? LORETTA MESTER: I do not have the jobs number. STEVE LIESMAN: You don’t have the number. JOE KERNEN: You could Tweet something. STEVE LIESMAN: Let me ask you the final question here. With all of what’s going on with other Central Banks, the Ecb is supposed to begin unwinding or raising rates later this year, I suppose. I keep getting mixed up we’re in 2019 already. Japan maybe. Is that part of the consideration of the Federal Reserve right now, that there is a global reduction in liquidity going on and that all of it together, not just the Fed, is really too much for both economies and markets to bear? LORETTA MESTER: I don’t look at it that way. I mean, it’s certainly part of the economic environment. But again, I’m focused on where is the U.S. economy going? Will that affect our markets? Will that affect our economy? And then setting our monetary policy to do what’s going to be best in terms of our dual mandate goals. So yes, we look at that as part of the economic environment. We understand sort of where other Central Banks are placing their policy. But again, I think they’re doing the same things we’re doing, is they’re trying to assess their economy as well. So we take into account the environment. STEVE LIESMAN: But how much further away from other Central Banks can we actually get? Isn’t that something that attenuates our ability to just go it alone? LORETTA MESTER: Well, we have so set our monetary policy to promote the U.S. economy and our dual mandate goals. And that’s our focus. STEVE LIESMAN: All right. President Mester, thanks very much for sitting today for this interview. Thanks very much. STEVE LIESMAN: Joe, I think she nodded a little bit to the left when you asked her about the jobs number. STEVE LIESMAN: She’s pretty upbeat. JOE KERNEN: You got copper. You got crude. You got stock market. You got the 10-year. You got all these things that seem to indicate the risk is on that side and I don’t see anything on the inflation side and we’re still going two. I don’t get it. That’s the only thing I don’t get. And if the market sells off today, it seems we’re afraid of prosperity. Anyway, thank you, Steve. And thank you for bringing us that interview.